Right C3 is proud to announce the Fourth Prize winner of the Senior Survey Scholarship Contest! Erick Aracil of Miami Florida was named the $500 Fourth Prize Winner. Erick told Right C3 that he is attending Miami Dade College to study Diagnostic Medical Sonography. His choice came after some months of deliberation. “I figured out I’d rather do this instead of physical therapy. 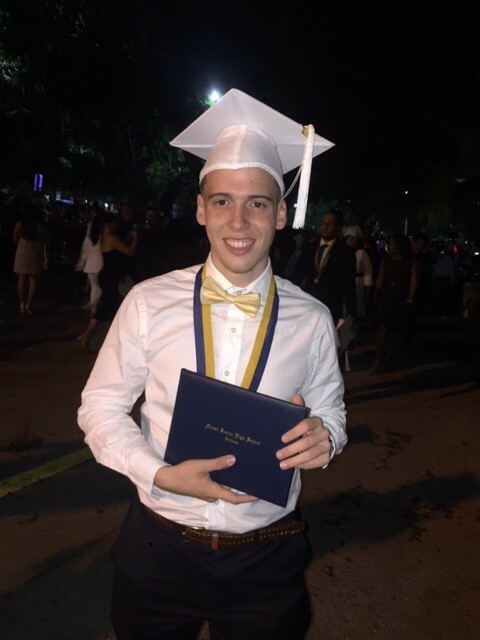 Sonography is a quicker way into the field.” He also liked the prospect of saving money by living at home, but Erick plans to eventually transfer to Florida International University to earn his bachelor’s degree. His parents were a great inspiration to keep his grades up and go to college. “My mom always pushed me to get better grades. She wasn’t impressed with anything but A’s.” His father went to college and became an engineer in Cuba, but his degree did not transfer to the U.S. Watching his father work in construction, he decided he didn’t want to work that hard for that little pay. Erick was able to find other support to help make his dream possible. “My girlfriend tutored me in math, which I really struggled with.” Erick also very much appreciated Right C3’s resources ““Before Right C3, I was an average student. I brought my GPA up to a 3.3 by using the tutoring and also brought up my test scores using the test-prep.” With this confidence and support, We’re sure Erick will succeed in his future plans.